As mentioned in the late-July McFarland, USA CCC post, I am a sucker for a good sports film. 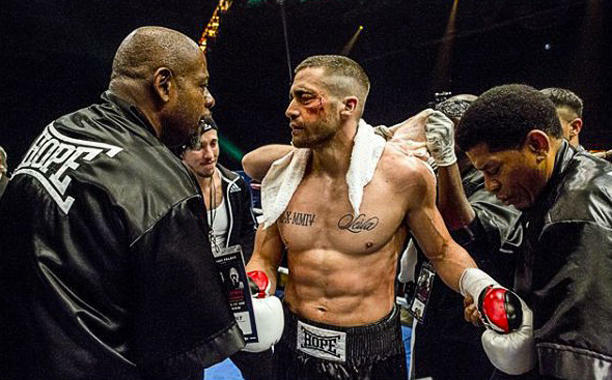 Therefore, I had been highly anticipating the release of Southpaw as it centres around the highs and lows of the boxing world, as well as it features Jake Gyllenhaal in the main role of Billy Hope. 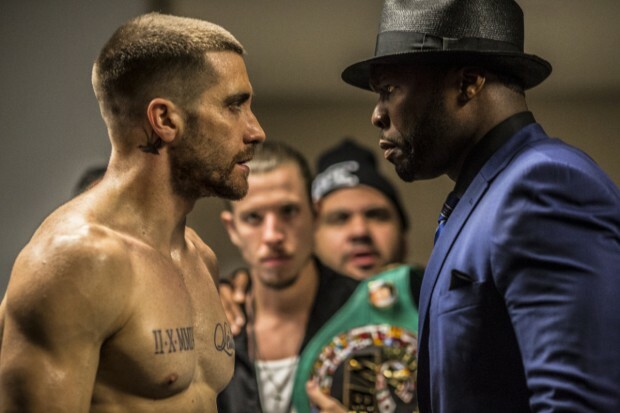 Southpaw was directed by Antoine Fuqua, who is known for his spectacular direction of Training Day, The Equalizer, and Shooter. Also, the screenplay was written by Kurt Sutter, and the film featured a spectacular supporting cast of Rachel McAdams, Forest Whitaker, Curtis “50 Cent” Jackson, Naomie Harris, and Oona Laurence. 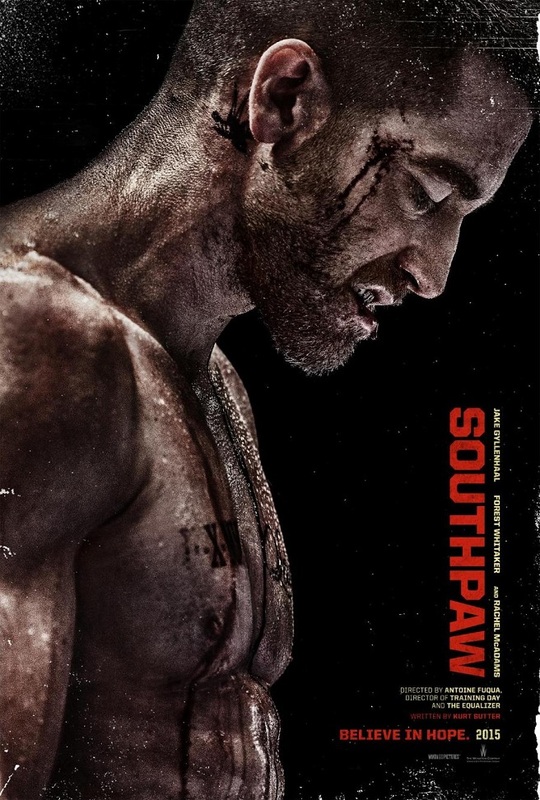 Southpaw begins with Billy on top of the world as he fights to defend his World Light Heavyweight title in spectacular fashion. 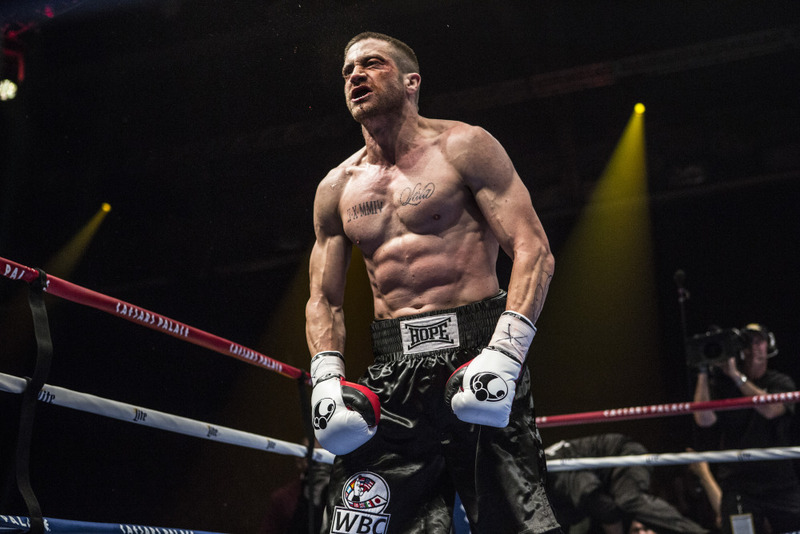 He grins wide, puts his fists in the air, and kisses his stunning wife Maureen (Rachel McAdams) in victory. However, post-fight we see that the the years of fighting have clearly taken their toll on Billy. He severely injured his eye in the match, is bleeding continuously, and can barely make his way to the shower to clean himself up for the press conference. 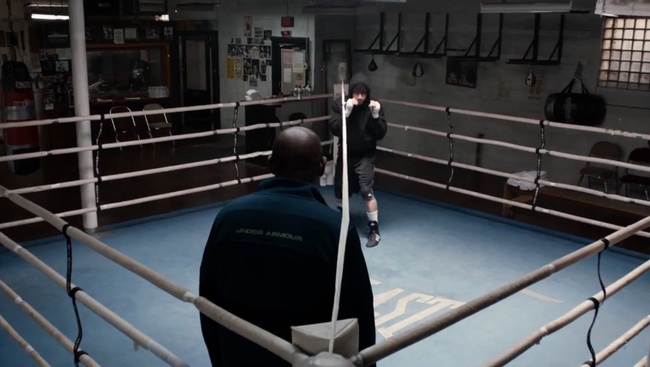 Maureen struggles with seeing Billy in this way and eagerly pushes him to hang up his gloves for good. Later in the night she urges him to retire so that he won’t end up “punch drunk”, which he instantly becomes defensive about. He argues that fighting is how he got both of them out of their group homes and is the reason why they have such a big house, nice clothes, fast cars, etc. But, she fights back and states that none of that will matter if he can’t process the rest of their life together with their daughter Leila (Oona Laurence). Billy is clearly contemplating retirement when he and Maureen head to a charity event that will help to raise funds for children that are still growing up in the situations of their past. Billy gives a heartfelt speech about how he fought to be where he is and how he owes so much of his success to his beautiful wife. However, soon after his speech the night takes a terrible turn.On their way out of the party Billy is taunted by another boxer, Miguel “Magic” Escobar (Miguel Gomez), about his refusal to fight him. Maureen desperately tries to get Billy to leave but the verbal assault continues and soon escalates to punches being thrown. In the scuffle between the two crews, a gun shot goes off. All of a sudden you hear the soft cry of Maureen calling Billy’s name and as the camera pans to the blood seeping from her dress your heart drops. The next couple of minutes tore my heart to shreds as Maureen attempts to convince Billy to remain strong for their daughter while he helplessly tells her everything is going to be okay. After Maureen’s service, Billy falls apart in all sense of the term. He knows that Miguel’s brother Hector is the true culprit, so he begins to search incessantly for him while also abusing drugs and alcohol. In his downward spiral he agrees to a fight that Maureen never would have been okay with, in order to attempt to pay off his debts. This is a terrible decision, as Billy basically allows the other fighter free access to pummel his face for what he deems punishment for what happened to Maureen. In the heat of the loss, Billy completely destroys his reputation by punching the referee in frustration. As a result, Billy loses absolute control on what’s left of his life. He is suspended from professional boxing, is sued by multiple parties, and soon has his belongings repossessed. This leads Billy to purposefully crash his car into a tree while drinking. 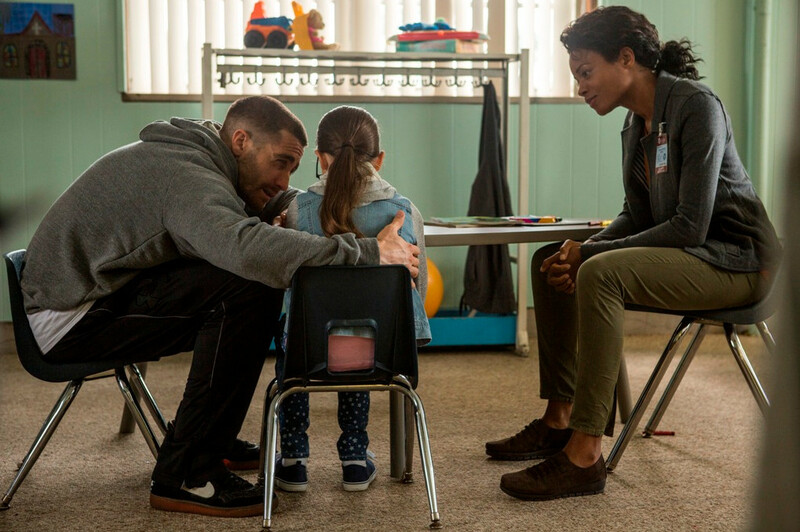 Due to this downward spiral, Billy loses custody of Leila as she is put under the care of Child Protective Services Officer Angela Rivera (Naomie Harris). Billy quickly realizes that he needs to sober up, get his act together, and prove that he is worthy of being the father Maureen knew him to be. He decides to go to Titus “Tick” Wills (Forest Whitaker) for a job, and eventually training, as Tick is the only man who trained a fighter that Billy felt ever truly beat him. Tick begrudgingly agrees to this in order to help Billy get his daughter back, as he continuously states that he no longer trains professional fighters so that he can make more of a difference with their community’s at-risk youth. I’m going to stop there so I don’t ruin the ending for those who haven’t had a chance to see it just yet. However, the list below includes a few of my favourite key parts so if you don’t want any more SPOILERS please SKIP THIS SECTION and move on to the Jake Gyllenhaal mini-actor spotlight! I love Rachel McAdams as an actress because she is a true chameleon. She was the perfect compliment to Billy in this film and as a result she created a lasting impression that had me empathizing with both Billy and Leila for the rest of the film. Forest Whitaker was exceptional as Tick! He was strict with his rules, he truly cared about the kids in his gym, and he was there for Billy when he had nowhere and no one else to turn to. The scenes where Billy helped to train one of the boys in the gym named Hoppy were adorable. You could tell that both characters were perfect for eachother as Hoppy lifted Billy up and Billy gave Hoppy the strength to carry on. This is why I burst into tears when Tick stated that Hoppy had died at the hands of his mother’s boyfriend. It was heartbreaking because those scenes had done such a great job of connecting the audience to Hoppy’s character. Exceptional work by both! Every scene after Maureen died between Billy and Leila made me extremely emotional because you could feel the overwhelming regret he had and yet understood her anger and sadness. 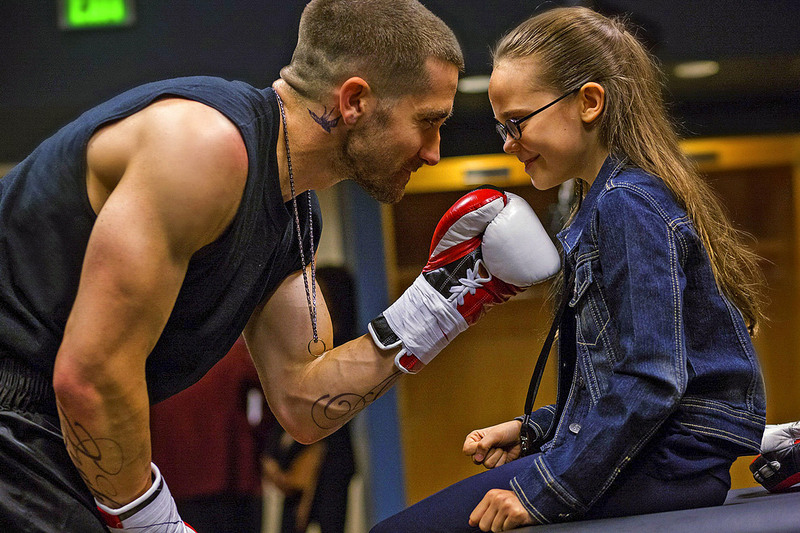 These scenes made the film for me, because although I wanted him to make his comeback against Miguel, I wanted him to reconnect with his daughter even more. Therefore, the final scene when he held her in his arms after the Championship fight was more important to me than the result of the match as he had finally won back her love. 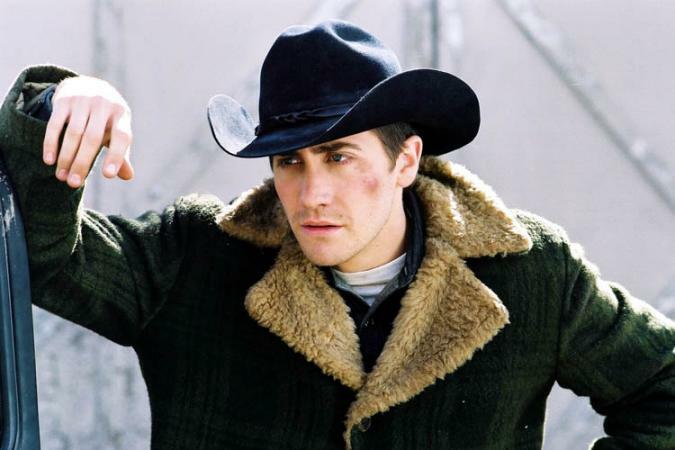 Bonus: Jake Gyllenhaal has earned several awards and nominations over the years, including and Academy Award nomination for his work in Brokeback Mountain. 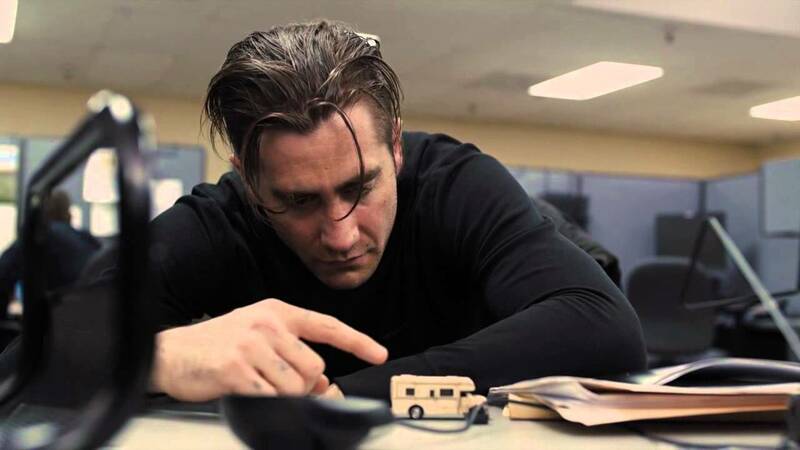 However, I’ve become more and more impressed by Jake’s acting in the past few years as he has taken on several roles with serious and dark undertones. 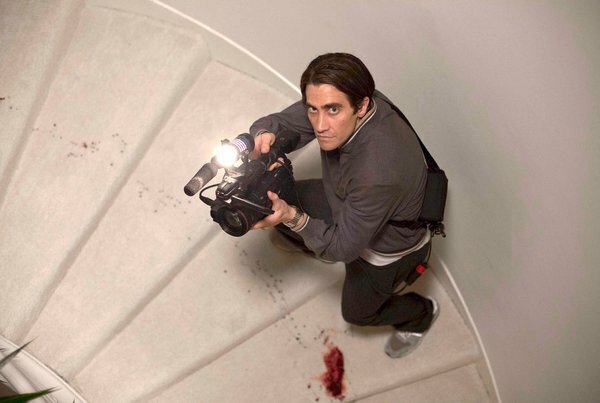 As a result, he recently earned a Golden Globe nomination for his unhinged performance in Nightcrawler. However, I personally believe he was snubbed when he didn’t receive a matching Academy Award nomination. Therefore, if you share my enthusiasm for his acting chops, check out the list below for a few of my favourite performances of his from over the years!